Kitchen Table Talks made clear that people care about the future of Scotland’s food and have strong views on what the Scottish Government could do to transform the food system: there is huge public appetite for a national conversation on the future of our food. Two years ago, the Scottish Government pledged to bring in new law to sort out the food system. They promised to consult before the end of 2017 but they haven’t, and they’re refusing to tell us how and when they might consult. So we organised an e-action for people to ask the First Minister to keep food on the agenda. Food sits at the heart of Scotland’s biggest challenges, from food insecurity to poor health, from workers rights to our warming climate. We have the skills and resources to turn this around – but we need new law to do it. 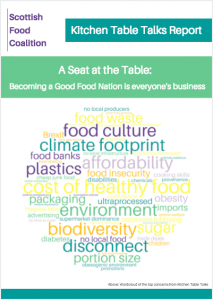 There is huge public appetite for a national conversation on the future of our food system – so we need the Government to open up the space for people to share their views and be heard. That’s the only way we really can become a Good Food Nation. The Government have already responded to our e-action and we’re not any the wiser about when and how they might consult on the Bill, so the battle continues! Sign up to our updates to stay tuned and hear about opportunities to get involved with the campaign! Huge thanks to the groups and people who took part in Kitchen Table Talks! You can still do Kitchen Table Talks! Download the documents below to help you get started.